Cuffufle Preserves make delicious home preserves with most of the main ingredients being grown and/or sourced locally. We have a massive range of chutneys, jams, vinegars and cordials which vary depending on what fruit and vegetables have been available. From apple to hot ginger and garlic, from red tomato to Pear, Christmas Courgette (which would be a perfect addition to your Christmas table!) from Raspberry and Rosemary to Plum and pineapple sage. Our favourites are my hot garlic and ginger chutney and tayberry and thyme jam – never served together however! We are a third generation family farming business, who decided that we wanted to sell our produce direct to our customers. It all started off with a small amount of asparagus that was picked fresh from the field and then sold through Maggie’s kitchen at Hilltop Farm. In 1999 John started selling our lamb and beef through some of the local Farmers Markets. We had such positive feedback from our customers, who loved the quality of our meat and who thought it was great be able to speak to the Producer first hand, that we made the decision to convert one of our old redundant barns into our own farmshop and Café. Our customers told us that they wanted fresh, local, fantastic quality products, so this is where we started. From day 1, when the shop opened in October 2003, our philosophy has been to sell great food, sourced locally (where possible), of the highest quality, at fair prices. Seasonality is key to everything we do and this goes hand in hand with local sourcing so that what we sell is as fresh as possible, with a low food miles. We are purveyors of speciality coffee, both beans and freshly ground, and speciality teas. These have been sold at locations throughout the Midlands at Farmer’s Markets, Local produce Markets and Food Festivals since 2007. Details can be found under markets and special events. The coffees are both free trade and fair trade from many of the countries that produce coffee beans. Some coffees are “Cup of Excellence” winners which means they are amongst the top coffees from that particular country. Many of these coffees are only available from markets and special events. Fermented foods are good for you and we at the Happy Gut Hut have made it our business to provide you with an excellent fermented health elixir: Kombucha. Kombucha is a fermented health drink that has been around for more than 2000 years. Lots of evidence that it helps to promote a healthy gut which in turn keeps your whole body healthy. It also gives you a lot of energy. But aside from this: It tastes delicious. Yes, you read that right, something that is good for you actually tastes nice! Better buy two bottles. 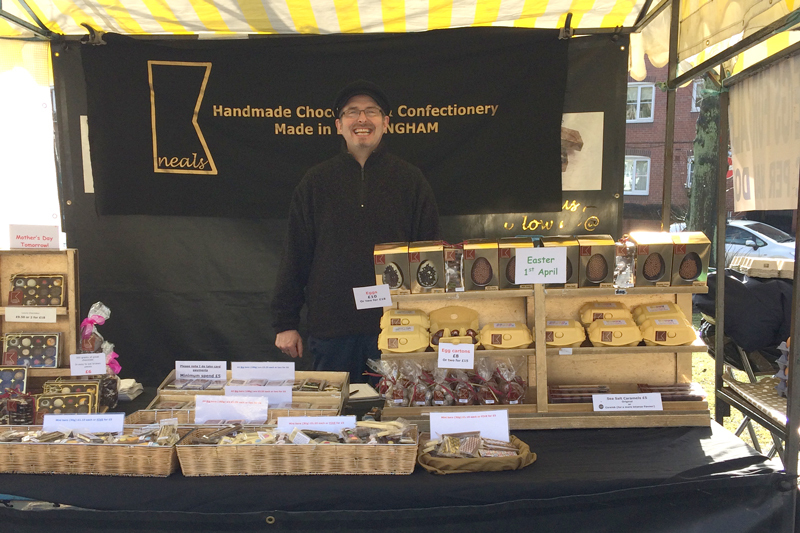 Kneals Chocolates is all about quality, locally produced handmade chocolates. We are constantly aiming to create new and interesting flavours for you to taste. Our traditional methods and craftsmanship enable us to provide you with a unique tasting experience every time. The methods we use are traditional and aim to preserve the delicious aroma of chocolate. Our chocolates are handmade and produced on a small scale; this enables us to provide the care and attention that is needed to achieve the best taste and texture. This also means that each of Kneals chocolates you will eat is a one-off unique treat. Our Luxury Pies are hand made daily to ensure that they are of the highest quality. The Fillings are prepared by hand and slowly cooked by us to ensure that the true flavour of the filling is not lost. The pastry has a light delicious crusty taste that melts in your mouth, which compliments our delicious fillings. Our meat pies and pasties have; no hydrogenated fats, no colours, no preservatives, and as an added bonus all of our pies can be frozen. Wenlock Edge Farm is situated in the beautiful South Shropshire hills in the Ape Dale (the valley of the bees) in the shadow of Wenlock Edge. This is countryside typical of the Welsh Marches; family farms interspersed with woodland and defined by the evocative “Blue Remembered Hills”. Historically, British Farmers always cured their own bacon and hams, this art has been continued and refined by Wenlock Edge Farm to offer the discerning food lover a range of the highest quality cured meats, sausages and pork products, from home reared pigs. Our bacon and hams have won widespread recognition through winning the highest accolades in the country and numerous gold awards. Our award winning sausages are described time and time again as “Proper Sausages”, a name that seems to have stuck. Blueberry Hill is a small company focused on producing high quality cakes using the best local ingredients available. The concept of selling cakes at Farmer’s Markets is particularly appealing as one of the requirements for accreditation is that products must be largely made from local ingredients – which fits well with our own ideology. The Farmer’s Markets also provide pretty immediate feedback from customers – and we really love all the positive comments. All aspects of the business have grown organically, driven by customer demand over the last few years. As a result the company has now relocated to our new ‘Cakery’, a converted dairy barn on the outskirts of Leamington Spa. Boulangerie Valentin – where the use of old fashion ways of making bread is still employed, with high quality local ingredients wherever possible and in season. The sourdough loaf, for example, has a unique flavour and crust: there is no need for additives or chemicals. In 1978, Gerald Dumas first learned the artistry of the French baking tradition and the technique of Masterbaker Armel Abit who in 1944 was one of the very few bakers in France where sourdough French bread was still being made. In 2008, over half a century later, Patrick Valentin took on the baton and continues to bring these values of culinary traditions to England. We represent a unique and delightful range of handmade bread, baked using wheat coming from local farmer’s in Oxfordshire and Warwickshire, who specially use mill flour to the necessary level to guarantee the high quality & standards the Bread Pancheon strive for, producing wonderful breads, cakes and pastries. We are fruit, summer veg, and arable farmers from Leigh Sinton, near Malvern in Worcestershire and supply fresh seasonal produce and apple and pear juices, along with fruit trees and cut flowers throughout the year at the market. We always have a very tempting display and you are welcome to have a little taster of our fruit before you buy. Fresh, seasonal fish are available all year round at Robbie’s Fishmongers. In season we have succulent cod, the much underrated haddock, beautiful salmon, tuna, and sea trout, as well as flavoursome mackerel and more unusual species like plaice and sea bass. We also have a good selection of shellfish including scallops and prawns. Please feel free to ask if you want advice on cooking your fish – we are always up for a friendly chat! Liz and Roger founded the farm in 1988 and have since grown the farm into a successful business, whilst also raising four children. 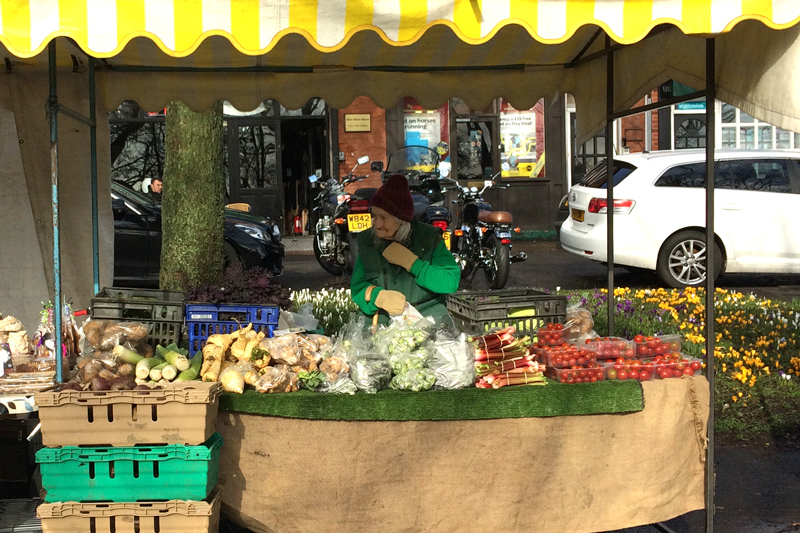 Things weren't always easy trying to sell vegetables on a commercial scale but since expanding into the world of farmers markets they have never looked back. Hibiscus Grove specialises in delicious South East Asian Home Cooking. Wonderful, tasty, ready cooked meals using styles from Malaysia, Sri Lanka, Thailand and Tamilnadu, Keralu and Goa. Where possible we use locally sourced free range eggs, chicken, pork, beef lamb and vegetables in our food. Although some of the names of our dishes may sound familiar to you, our versions have been made using authentic recipes passed down through generations of our family. All our meals are free from preservatives, MSG or gluten. Starting up in 2009, the past 6 years has taken myself and my van to many wonderful and diverse events. Although we started off as a Porridge company (I love Porridge!) We are become increasingly well known for our Gluten Free Granola range, especially our Salted Honey and Pecan nut which is a firm favourite. All 4 Granola's within our range are Gluten free and there are also Nut free, dairy free and Vegan friendly products. Cheesemonger & affineur specialising in raw milk British and continental cheeses. Many of which are award winners. Curds & Whey are Artisan Cheesemongers and Affineurs. We work directly with only the best British and Continental cheese producers to ensure our products are second to none. We pride ourselves on aging our range of cheeses until we they are perfect to release to our customers. Many of the cheeses we offer are award winners at the British or World Cheese Awards and some of our range is very hard to locate elsewhere. Our customer base is wide spread, reaching across several counties where we attend many monthly Farmers Markets, food festivals and events. Suppliers to Michelin starred restuarants ! Augernik Fruit Farm is a family run business based on the Worcestershire and Shropshire Borders at Hopton Wafers. The Auger family have lived and farmed the 25 acre site since 1989, each year increasing the range of fruits being grown and investing profits back into the farm and its environment. Produce is grown without any artificial inputs or chemicals, making wonderfully natural, wholesome and delicious crops. The extensive knowledge of the owners means crops are nurtured and protected using natural methods- this has allowed them to be part of The Wholesome Food Association.